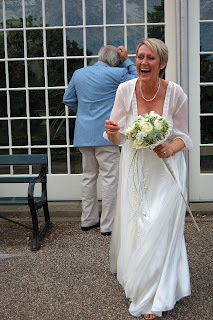 Welcome to my new regular post which is all about your Wedding Day. I want to hear your wedding stories and what you did (or didn't do) to include old, new, borrowed and blue. Was it your wedding dress? Jewellery? Flowers? or something else? 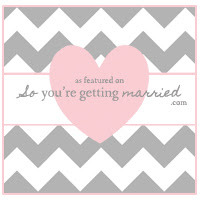 Did you get married recently or was it a while ago? Abroad or in the UK? Every wedding is different and incredibly personal and I thought it would be lovely to share experiences. As some of you know, I got married recently at the fabulous Botanical Gardens in Sheffield and there is nothing I love more than hearing from you and your stories. If you have a few photos, too, that would be fantastic. Leave me a comment in the box below and I will get back to you by email. I'm not a great lover of gold jewellery, my engagement ring and wedding ring are very simple, plain and platinium. However, my wedding dress had delicate gold thread embroidered into the bodice, and so I decided to wear my Grandmother's Art Deco bracelet watch. It's made from pretty rose gold, with diamonds and rubies - the watch part is concealed under a front panel and is opened by a little catch. The watch doesn't work and one of the larger rubies is missing, but I wore it for sentimental reasons and I like that its not perfect. That was easy! Most of what I was wearing - my dress, my sandals, my underwear (although that was the hardest thing to buy) Thank heaven for Bravissimo and their fabulously helpful team. They got a special mention in Mike's speech as I was pretty much best friends with their lovely ladies, and not the mention my new-found relationship with the postman! I adore pearls and have several strings but I borrowed my Sister-in-Law's to wear. Although I have two fab brothers, Mike's sister, Caroline, has always been my surrogate little sister. Mike and I bought the little seed pearls she lent me from Liberty years ago for her 18th Birthday and she really wanted me to wear them as they had a special resonance. I'm glad I did. 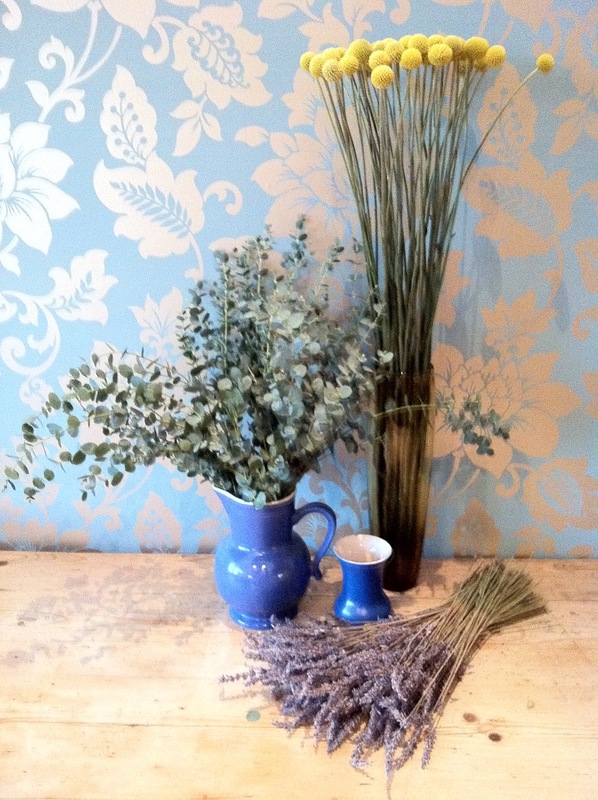 I pushed a few sprigs of dried lavender into the back of my bouquet which is a neat little trick I now offer all my Brides in case they are struggling with the 'blue' bit. My bouquet was all whites creams and greens and constructed into a cornucopia. 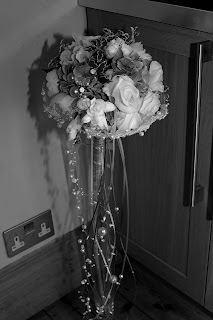 As a florist who specialises in weddings, choosing my flowers was one of the hardest things I had to do. The problem with being an experienced florist is that you know how infinite the possibilities are, which makes choosing for yourself so much more difficult! I knew I wanted something I had never made for anyone else before and so developed the cornucopia concept as it's shape and styling is Neo-classical and worked well with my Empire-line dress. I incorporated tiny shell beads, pearls, various ribbons, gold bullion and gold beads into a collar and trails to create a very soft, romantic, Byronic look. I loved it and still have the sprigs of lavender in my box of special bits and pieces from our wedding. The lovely Sara of Under the Vintage Veil featured our wedding recently on her blog and its made me think that I might post the full story later on in the week, so if you are curious to know more ... watch this space. In the meantime, I'd love to hear what you think about my choices and know what you are planning or did on your wedding day. Use the comment box below and I promise I will reply. 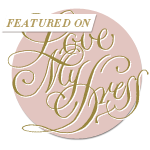 Good morning all, I'm kicking off the week with the return of my regular guest blog feature 'My Favourite Things'. This week it's the wonderful Anne-Marie of Posy Rosy (click on her name for the link), who has been one of the nicest friends I've made since embarking on my new venture. She's always been really lovely and helpful - especially when I'm flummoxed by technology and, to me, epitomises all that is good about social networking. I have collected or had handed down so many lovely treasures over the years that it is quite hard to select just the one, some have sentimental value and others hold so much history in their faded elegance. I love the old worn tin box that held my grandma’s odd button collection. She was a factory machinist for Double D shirts and her home was like a mini haberdashery shop. She used to make the most exquisite dolls clothes and pram sets for me and my sister on her ornate treadle sewing machine (I wish we still had that!). I remember when I was small she would give me her button tin to keep me occupied and I would spend hours sorting the colours and textures and shapes only to jumble them up again when I put them away. I use it now to store some of my vintage brooch collection and it often makes an appearance in my staged photos. Some of the remaining buttons have made their way into my designs. Then there is my lovely snakeskin 50s handbag which I bought from a vintage shop for just £15! 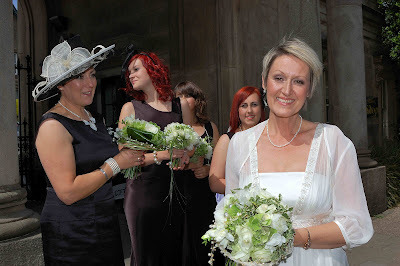 I used it to accessorise my 50s style outfit at my eldest son’s wedding. 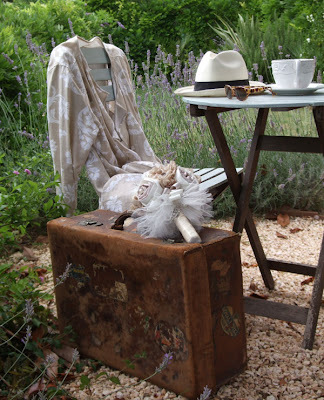 I adore the white 30s feather cloche hat that I bought at a Vintage market in Barcelona, it’s made in Paris and needs a little repair and I have no idea if it will ever be worn again but it is so beautifully crafted. I can imagine it being worn by some Parisien femme fatale or adorning one of the dancers in Swan Lake. Perhaps I would choose my bashed and battered suitcase that has travelled the world on cruise ships and trains and still bears the faded labels of a forgotten time. Spoilt for choice I have shared them all photographed in my garden, another one of my favourite things and the inspiration for many of my designs. My thanks, to Anne-Marie and if you would like to be part of 'My Favourite Things' send me your story with a couple of photographs and I'll be happy to include you in this regular post. When I first decided to set up my floristry business in Sheffield, I knew I wanted to concentrate on designing wedding flowers initially. Writing a fairly rough business plan, I soon realised that retail premises weren't necessarily a priority and that my idea from years ago of working from a purpose-built workshop in my basement was a much more sensible way of spending my capital. So that's where we invested our money. I was nervous at first as I felt that without a shop-front I wouldn't be taken seriously. 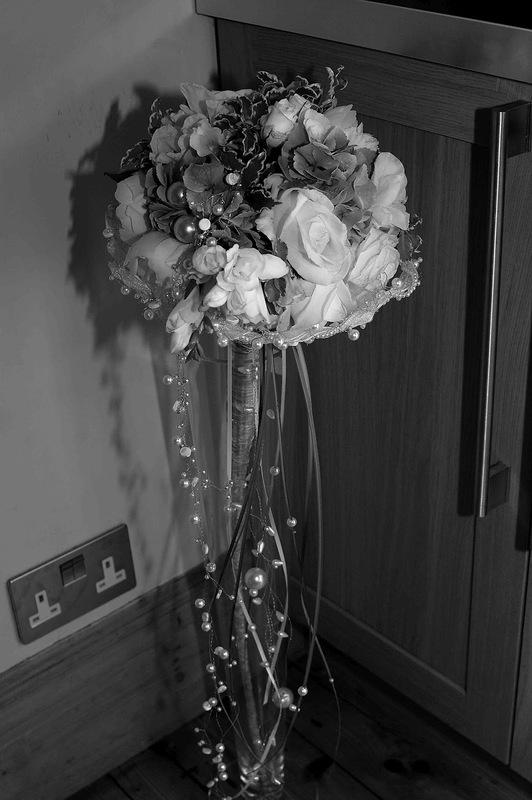 Brides, quite rightly, want to feel re-assured that the person they have chosen to design faultless flowers on one of the biggest days of their life, is entirely trustworthy and reliable. I couldn't have been more wrong about the shop front though. 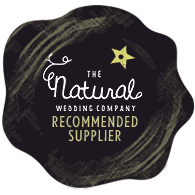 What I am able to offer Brides is a very flexible service and I can easily provide an initial consultation in my workroom, at their place of work, home or even in a convenient tea room, Cafe or Deli if required! The lovely thing is that, to date, every single Bride has chosen to come here and all, bar one, have booked. So my initial fears seem to be completely unfounded. Buoyed by my recent success, last weekend, my best friend and I went shopping and added some extra touches, which I love and contribute to the overall comfort and ambiance of my room. Its a very personal, comfy, cosy space and I like to think is quite relaxing for Brides. We always have plenty of tea and usually some good home-made cake, lots and lots of fabulous magazines and my portfolio to look through to help reach those all-important decisions. This week I also had the most fantastic write-up in the Postcode Gazette (click on the link to see the full article) which, again, reinforced my new-found confidence in my choice of premises. It's early days and I might expand into different premises as the business grows, but for now I'm loving my place of work! If you would like to book a consultation, you can contact me directly through my facebook page Campbells Flowers and click on the 'Contact' icon on the left-hand side under my logo. Have a great weekend and I'd love to hear what you think of my workspace or any experiences you've had of wedding consultations. Morning everyone! Blogging's taken a bit of a back seat this week due to a HUGE number of plans in the pipeline, one of which is re-launching my Flower School and providing regular floral workshops. On trying to choose a suitable venue, I really had to have a good think. Last time I ran my classes, I used one of my local Parish Halls, which was fantastic, but didn't quite give the cosy feel I want to associate with learning in a relaxed environment. Luckily, whilst running my latest pop-up shop at Pure Enough, with my great friend Amy Freann-Worthington, I was introduced to Chris who runs the fantastic Snap Deli. I started chatting and it soon transpired that he had been thinking about getting someone to come and make use of his gorgeous Deli in the evenings - and floral demonstrations were just what he wanted! So, my first workshop is on Wednesday 7th March 2012 from 6.30pm - 8.30pm. Come along and I will demonstrate a step-by-step fabulous arrangement, which you can proudly take home. I'll also provide all your flower material, foam, tools etc and Chris has agreed that the lovely Isobel will be on hand to take orders from an impressive range of teas, coffees and delicious home-made cake. The cost of the evening is just £25.00 - an absolute bargain in comparison to some of the prices being charged locally! All I ask you to bring is a camera (your phone will be fine if it has a flash) and a notebook if you want to know exactly which flowers we have used. I always let everyone have the full botanical and variety names in case anyone ever wants to make the same arrangement again - it makes ordering from your florist so much easier! If you would like to book then you can contact me by email or 'like' my facebook page http://on.fb.me/yTm9sy and then click on the little 'contact' icon on the left-hand side. You can then message me directly and ask any questions you need to! Half fill the vase with water. Cut some sprigs of eucalyptus off and remove the lower leaves to about 1/3 of the overall length. Place them roughly to the right of your design. The foliage will act as your 'mechanics' and gently hold your arrangement in place. Very carefully strip three tulips of their lower leaves and cut them down to size. Tulips are quite brittle and can snap quite easily. Place them to the left of the design, in a row. Now add your roses in a group in the centre of the design so that the final look is quite natural, but is visually balanced. That's it! A pretty, simple little arrangement which is well-made and really easy to adapt to incorporate your own materials and flowers according to a colour palette or theme. I hope you enjoy making this - let me know how you get on. If there are any tutorials you would specifically like me to prepare, leave a comment and I'll get back to you. All materials are available from any good florist in your area. Give them a ring or pop in and ask if they can get what you need. This got me thinking, about the care of flowers. Florists on the whole, are very good at getting your beautiful bouquet or arrangement to you without any problems, but many of them forget to give you care instructions. This is a shame, because looking after your flowers will have a huge impact on how long they last. If you follow the guide below, you can seriously extend the life of your flowers. * If you receive flowers in an aqua pack, don't leave them in the bubble of water for any longer than a day or so as this is just meant to keep your flowers fresh for travelling, and isn't a ready made vase! There's only a limited amount of water in an aqua pack and it degrades very quickly which can half the life of your flowers. * Make sure the vase you put your flowers into is clean. Flowers are like people - they object to drinking from dirty glass! * Always re-cut a couple of centimetres off the bottom of the stems, at an angle, before putting them into water. The stems of cut flowers seal up naturally, particularly if they are out of water, and they can't drink effectively until you re-cut them. This is the single most common cause of why a bouquet of flowers doesn't last. * Use lukewarm water - flowers prefer it. * Use the flower food - it works! Although don't use it for bulbs - particularly tulips (it makes them bolt). * Every variety of flower has a different life-expectancy, so if you receive a bouquet of mixed flowers, make sure you remove blooms which have faded or are dying, to give the others a chance of a longer life span. Flowers produce an unseen gas called Ethylene which speeds up the breaking down process of your other flowers. It's used artificially in the food industry to ripen tomatoes - which is why it's also not a good idea to leave your vase or jug of flowers next to a fruit bowl! * Change the water in your vase every couple of days to keep it fresh. * Don't put your flowers on top of the telly, by a radiator or on a hot window sill - they much prefer a cool place. This might seem like a lot, but if you think about it, once pollinated, flowers naturally concentrate on dying in order to produce seed, whereas we try and make cut flowers last as long as possible. If you follow these simple steps, though, it will really help extend the life of your flowers which makes you, the person who sent them and (take it from me) the florist very happy! Finally, as we've just had Valentine's Day, a special mention for roses. Roses are very thirsty creatures and like very deep water, so try and put them in a tall vase. Keep an eye on the water level - I've had them drink a vase full on a warm Summer's Day! Make sure you re-cut them every time they go into water as rose stems are notorious for sealing up and causing an air lock, which stops water getting to the bloom. You can tell if roses have an air-lock as the head droops and the top of the stem is soft and bendy. To cure this, re-cut the stems and put them into a plastic container of about 4-5 cm of boiling water and leave them for approximately 30 mins. You should see bubbles coming out of the bottom rose stems. 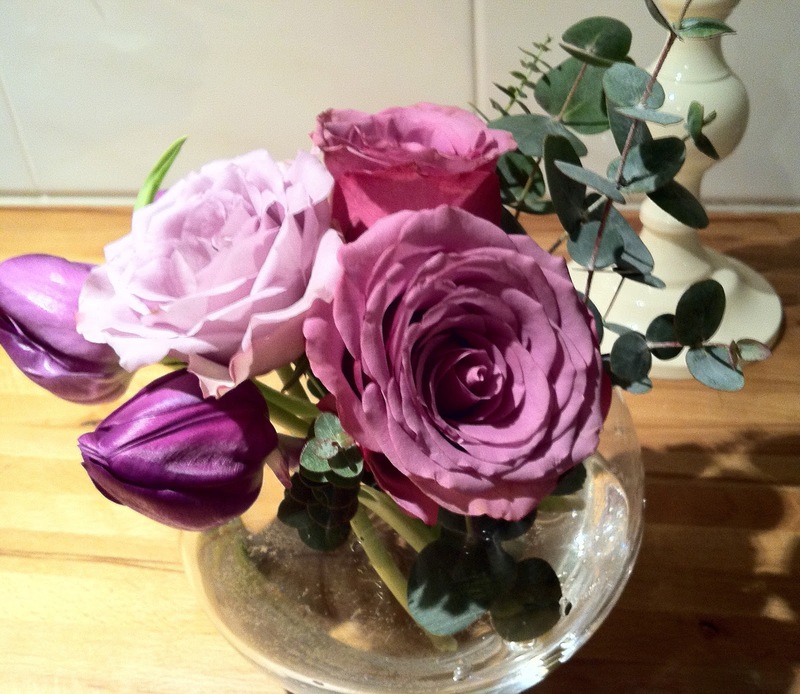 Once the water is cool, re-cut them again to remove the discoloured stems and you should have lovely pert roses once again! 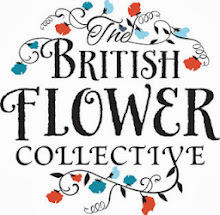 I hope this has been helpful, let me know if you have any problems with your flowers and I will try and help with advice on how best to look after them, or I'd love to hear stories of bouquets you've received and what made them special. Until next time. Enjoy! This week we will be moving on from the wired buttonhole you made last week, and using very similar techniques to make a wired circlet headdress suitable for a Bride or Bridesmaid. The beauty of using Parafilm is that, not only does it produce a better, finer result, but it sticks to itself, which makes putting everything together much easier. Stick two wires together and repeat this twice more so you have three sets of wires in total. Then join these together with tape, making sure that all wires are completely covered so that nothing can stick into the wearer! Cut off the rose stem at an acute angle and insert a .71 green wire into the rose. The push a .21 silver wire into the calyx and bring both wires down to meet the green wire. Next, tape the rose. Again, if you need any of these techniques clarifying - see my Campbell's Flowers YouTube Channel. Next, attach the wired material to the circlet frame using more tape. You might find it easier to use strips of tape cut from the roll, as this is sometimes simpler to handle. Cut off excess wires and tape over all the ends to make sure nothing sharp is left in the design. Your final design should look a bit like this. I hope you've enjoyed making this design - please let me know how you got on and whether you think this was easier, or more difficult than you thought it would be. I'm will endeavour to answer any questions left in the comments box as soon as possible, alternatively, let me know if you would like me to contact you to arrange one-to-one tutorials, or group workshops for you and your friends ... or even your hens! I have to be honest, I love architectural simplicity. 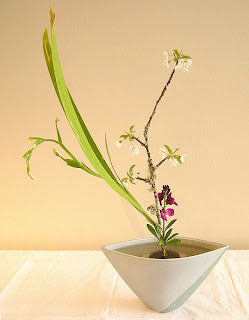 I'm not a complicated girl and much as I love all flowers - and most design styles - but Ikebana holds a special appeal in that you can really examine each bud, bloom, stem and leaf in isolation. Its simplicity of form, use of negative space and natural purity are truly beautiful. To me, it holds an even greater appeal in these financially difficult times - its inexpensive. Although, undoubtedly, perfecting and representing the true art form of Ikebana can take many years, Europeans have interpreted this overall concept of flower arranging with some success in the past. None did it better than Constance Spry - one of my all-time heroes. Before her pioneering attitudes towards flowers, flower arranging and teaching the masses - flowers were very much the preserve of the rich. She was my kind of woman - a feisty, social reformer who believed that with a little imagination your home could be transformed with flowers picked from wasteland and hedgerows. She famously worked with simple materials such as berries, ferns, vegetable leaves, twigs and weeds and displayed them in anything she could get her hands on - gravy boats, tureen lids, baking trays and yes ... bird cages! Sound familiar?! If you thought 'Vintage' or 'BoHo' was new - think again! As with all fashion and trends, ideas come and go and return, perhaps with a different name - but essentially the same concept. The beauty of working with the current trend, though, is that its both personal and interpretational. If you truly want something 'different', don't be swayed by lots of pictures of jam jars or tea cups - everyone's doing that. Think of the fabulous Constance Spry and have a really good dig in your cupboard - you never know what inspiration you might find! I've used a decanter and a bottle of St Germain liqueur I kept after using it to make cocktails on my hen night! Lastly, if you, or any of your friends have been to a wedding, or used simple, imaginative floral displays for their own wedding, let me know. As you can probably tell, I love sharing and would be happy to feature them on my blog. Until then, enjoy! I love the way the blogging community provide insights into what’s new, fresh and exciting, and nothing could be more so than two of the latest colour palettes for this year – blue and yellow. In their purest saturated forms these primary colours create a contrast which is eye-catching to say the least and are reminiscent of the Mediterranean - evoking sunny, clear blue skies and hot yellow suns. Combined, these colours create a fun, exciting scheme suitable for a wonderful outdoor summer wedding, this theme would certainly make a change from the vintage-inspired pastels which have been so popular of late. A word of caution though, always avoid using darker shades of blue in areas that aren’t well lit - it’s not really suitable for dark churches or panelled rooms. Blue and purple are the most recessive of all colours on the colour wheel and can sometimes create visual ‘holes’ from a distance in floral decorations, and might give the impression that something’s missing from your arrangement! To give you some ideas of how these colours work together, I’ve made a variety of Bridal bouquets – some structured and some more open, loose and romantic either of which would work with a range of different styled Bridal gowns and overall concepts. 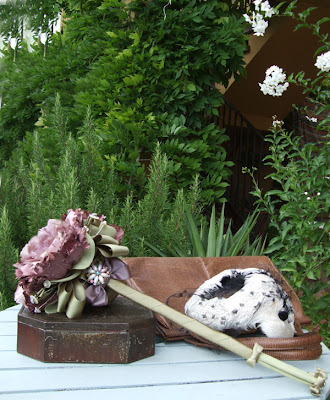 In addition, the buttonholes and wrist corsages should give hopefully give you some ideas for the bridesmaids and groom. Finally, I put some table and vase designs together to show how these could compliment each other and work as part of your overall theme. I hope these designs give you some ideas and inspiration and brighten up your day as much as they did mine! A table centre design using the flower and foliages in a more 'Boho' interpretation. I hope these designs have provided you with some inspiration. Which is your favourite? Mine's the structured crespedia and lavender bouquet, probably because I've always been a bit of a rebel when it comes to being creative and the short stemmed, pretty, delicate hand tieds full of vintage roses are very much 'in' at the moment! This morning I am delighted to say that the lovely Jane from Tea with Ruby, who specialise in Vintage Styling and China Hire, is our guest blogger this week. As part of my regular 'Favourite Things' feature, I asked Jane if she could photograph one of her most precious vintage items and tell me why this item holds a place in her heart. "This little pretty teacup was the first teacup I bought. Unbeknown to me that it would be the catalyst into me starting a business built around pretty teacups. I found it hidden behind lots of other bits and bobs in an antique barn in Snape Maltings, Suffolk whilst holidaying in a little cottage near the sea at Aldeburgh. That year was the summer England seemed to sink under all the floods apart from the week we went to Suffolk. My little girl Ruby was 2 and loved every minute of being near the sea, we had to go say hello to the beach on a morning and wave goodnight before bed. It was such a magical holiday and the little Royal Crown Derby teacup is a treasured keep sake that evokes precious memories." Tea with Ruby have an ever-growing collection of vintage teacups, saucers, plates, milk jugs, sugar bowls, teapots, cake stands and table cloths which they can share with you to make your event utterly beautiful. Each piece is individual but if you would like anything specific please let Jane know and she will see what she can do as she is always finding new things. Along with the hiring of vintage china, Tea with Ruby can style your event too, arranging your tables and laying them up to perfection. Prices are available on application, as each occasion is unique. Contact Jane for more information on http://teawithruby.co.uk/. My thanks to Jane for her contribution - if you would like to tell your vintage 'Favourite Things' story, then please get in touch. 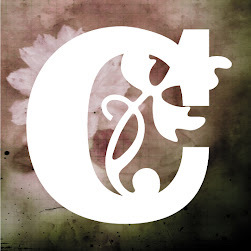 When I first set up Campbell's Flowers, it was always my intention to use my teaching experience and post regular tutorials, at the time, I naturally thought it would be best to start with the easier designs first. But then I thought that if you miss a couple, or if you've already had a bit of floristry experience, it might be good to 'grade' each one, so you can dip in and out as you wish. The categories I've chosen are Beginner, Intermediate and Advanced - let me know if you think they are accurately graded (or indeed easy/difficult to follow!). Push the hair pins into each of the sepals to secure the rose. 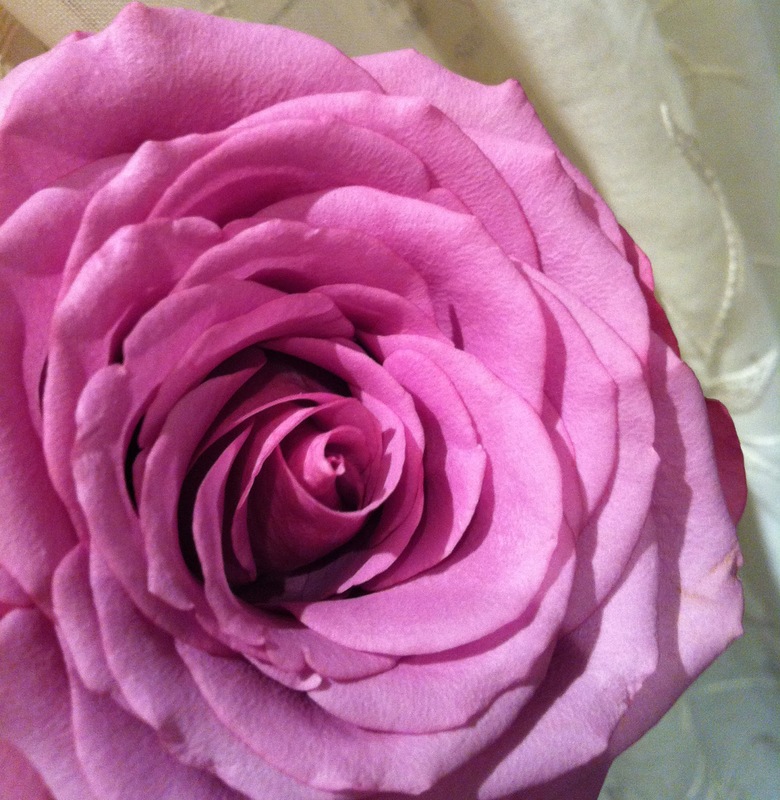 Even if you are using a open 'blown' rose, this is good practice as it stops the flower from shattering and losing all its petals. Cut the rose stem at an acute angle and gentle push a green .71 wire into the stem, until you feel resistance. Don't push to hard or far, or the wire will pop out of the top of the rose! Next, using a silver .21 wire, push this downwards to meet your vertical green wire and stem. Next, taking a piece of gutter tape, stretch a tiny bit at the beginning of the tape and it will stick nicely to the back of the rose. The taking the length of tape pull gently with one hand and twist the rose with the other hand. Don't be tempted to 'wrap' the tape, it won't stay in place and will just unravel. The technique is to pull and twist. I've done a series of YouTube 'How to' videos the link is http://bit.ly/wvPfR8 which might help, especially if, like me, you're a visual person! So your fully wired and taped rose should look something like this, don't worry if its a bit tricky at first, this does take a bit of practice. Wire and tape all the other materials in the same way, again, if you're stuck my YouTube videos break down the process. Keeping one wire parallel with the stem, wrap the other wire over two or three times. Then open the wires out and cut off the excess stem. Your leaf should look like this! Tape this off in the same way you did everything else. Then I've placed two lisianthus buds behind the design to break up the textures (opposite textures work best ie smooth next to rough, velvety next to fluffy etc). Finish with the ivy leaf at the front of the design ... and you're done! Hope that was fun and satisfying! There are lots more tips to help you on YouTube if you search Campbell's Flower School. Leave me a comment if you need any specific help, or if you want to organise workshops or one-to-one tutorials, let me know.